We’re very excited to announce that we’ll be returning to the Bryn Celli Ddu landscape on Anglesey, for the second season of our public archaeology project this June! 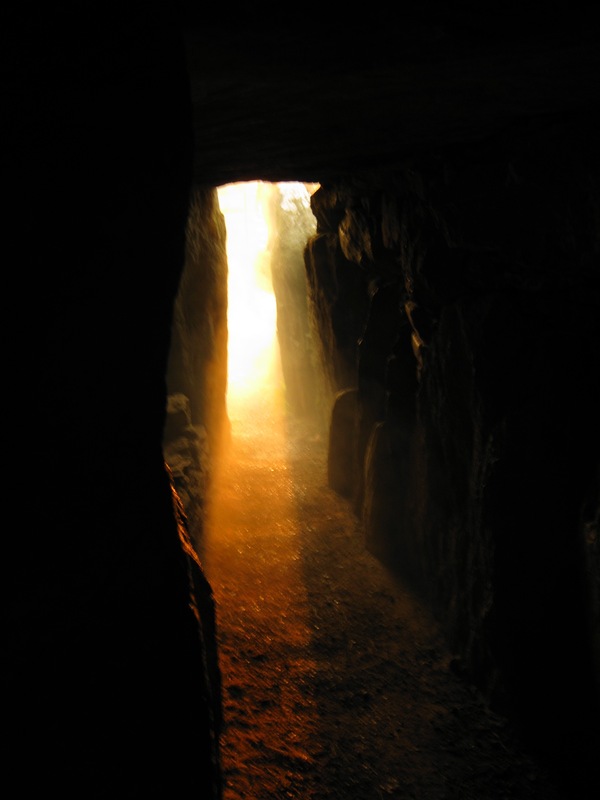 The project will focus on the landscape surrounding one of Wales’ famous Neolithic passage tombs – Bryn Celli Ddu, exploring hidden features that have been previously overlooked. Until recently, not much archaeological attention has been paid to Bryn Celli Ddu’s wider surroundings. This is something that our excavation hopes to rectify – a collaboration between Cadw (the Welsh government’s historic environment service), Manchester Metropolitan University and the University of Central Lancashire. Last year, we spent time re-examining the known rock art, which saw the decorated outcrop next to Bryn Celli Ddu excavated for the first time. Our excavation suggested that the outcrop could be as much as three times larger than previously thought, so the known cupmarks may represent just the tip of the iceberg – though as the site is so disturbed by later quarrying, we can only speculate as to whether the ancient artwork might have originally been more extensive. But that was only the start of the story. On rising ground within sight of Bryn Celli Ddu, and with views of prominent landmarks such as the Snowdonia mountain range, we discovered four new unrecorded rock art outcrops. The cups themselves numbered in their dozens – the largest concentration, on ‘Outcrop 1’, was made up of at least 40 – and while at first glance the marks appeared to be scattered randomly, on closer inspection we could see clusters forming ‘rosette’ patterns, while others seemed to follow the lines of natural fissures in the rock. Still more formed ‘dumbbell’ motifs, where two cups are linked by a shallow groove. This year we return to explore further along the ridge where the new outcrops were found; it may be that even more rock art locations will be identified, further adding to our picture of a possibly ritual landscape that is now coming into focus around Anglesey’s celebrated tomb. 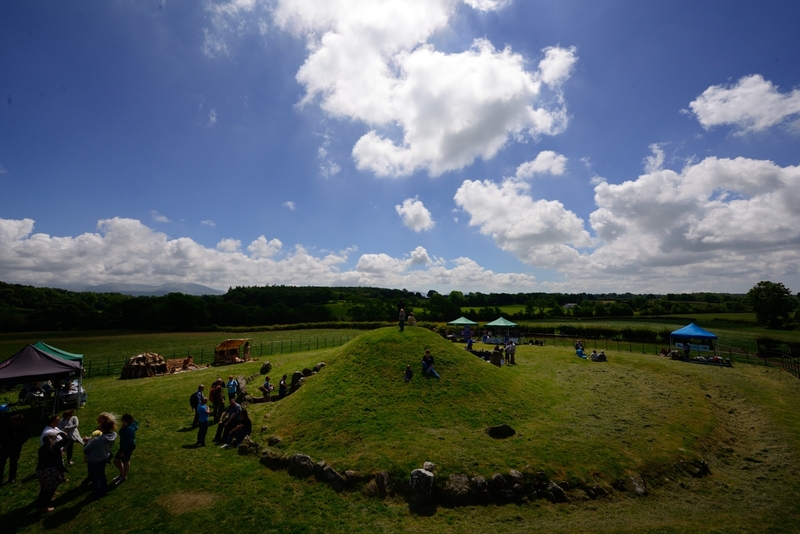 A series of volunteering opportunities, workshops and events will be running at Bryn Celli Ddu this June, and volunteers are now sought to take part in the excavation. 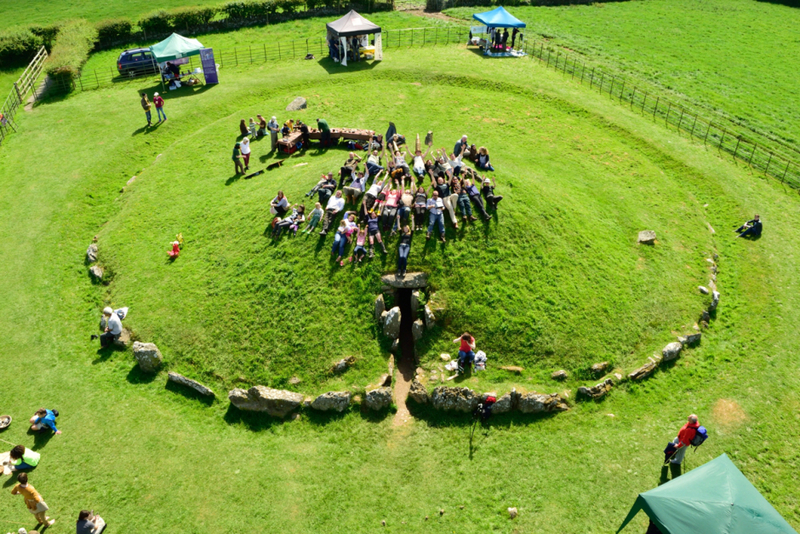 An Archaeology Open Day will take place on the 18 of June at Bryn Celli Ddu itself, with workshops, art installations, and tours of the Bryn Celli Ddu monument and the excavation. There will also be a stargazing event on the 20 of June. If you’d like to get involved, please email CadwPublicProgrammes(at)wales.gsi.gov.uk for more information. The Bryn Celli Ddu Public Archaeology Project is a partnership between Cadw, Manchester Metropolitan University and UCLAN, directed by Dr. Ffion Reynolds, Dr. Seren Griffiths, Dr. Ben Edwards and Adam Stanford.